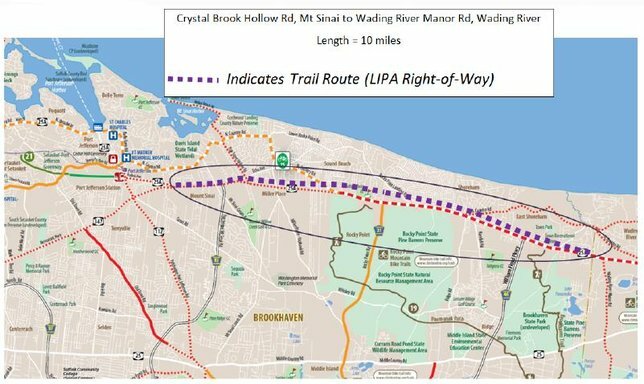 Suffolk County Legislator Sarah Anker is pleased to announce that there will be two public information meetings for the Port Jefferson-Wading River Rails to Trails project. A map of the proposed Port Jefferson-Wading River "Rails to Trails" project. Miller Place, NY - March 15, 2018 - Suffolk County Legislator Sarah Anker is pleased to announce that there will be two public information meetings for the Port Jefferson-Wading River Rails to Trails project. The first meeting will be held on Thursday, March 15th at 6:00 PM in the Miller Place High School Auditorium, and the second meeting will be on Wednesday, March 28th at 6:00 PM in the Shoreham-Wading River High School Cafeteria. The meetings will be “open house” style with maps displaying the proposed trail path. Representatives from the Suffolk County Department of Public Works and the Police Department will be available to answer questions. Written comments will be accepted. The proposed trail is a 10-mile shared-use recreational path. It will be built along the abandoned Long Island Rail Road right-of-way, currently owned by the Long Island Power Authority, which runs parallel to NYS Route 25A. The trail will run through the hamlets of Port Jefferson Station, Mount Sinai, Miller Place, Sound Beach, Rocky Point, Shoreham, East Shoreham, and Wading River. There will be a second informational meeting scheduled for later this spring. For more information, please contact Legislator Anker’s office at 631-854-1600. Subject: LongIsland.com - Your Name sent you Article details of "Legislator Anker Announces Two Public Information Meetings for "Rails to Trails" Project"